Day 24 of JIRP and the pace is picking up. Since arriving at Camp 10 – situated near the Taku Towers – weather has been a pleasant surprise. With two beautiful sunsets behind us and a few students choosing to sleep out under the stars, spirits are high. However, the weather isn’t the only thing creating excitement: science is in the air and students are beginning to refine their student projects. But even with all the excitement of a new camp, beautiful weather, and student projects, it seems like just yesterday we were participating in the inaugural JIRP Glacier Games at Camp 17. The games were led by Kate Baustain and Sarah Bouckoms – two of the five Field Safety Staff members – and were just what the students needed to counteract the several days of continuously inhospitable weather. These games were a whirlwind of excitement and consisted of ten events. The winners of these events not only took home bragging rights, but also a gold medal (made from the tops of Spam cans). The events included snowball throwing for accuracy and distance, javelin (ski-pole) throw, 100-meter sprint on skis, downhill-slalom, and two eating contests (Spam and Pilot Bread). Christian Hein took home gold in the snowball distance competition, Uwe Hofmann had the most accurate snowball throw, Sarah Cooley placed first in the 100-meter ski sprint, Molly Blakowski won her gold by eating Pilot Bread the fastest, and William Jenkins came from the back to take home gold in the javelin. I understand the games may come across a bit silly, but they were more than just a way for students to showcase their talents. When traversing the icefield, you could be roped up with any four of the 23 JIRP students. When roped up, a certain amount of trust is needed to safely navigate the icefield. And although there are several ways to build this trust, these games helped to instill confidence in each other and acted as a team-building event. The skills and bonds created will have a lasting impact on our group. Sarah Cooley maintains the lead from the start of the cross country ski race. Photo by Adam Taylor. When your loved ones return to you, they may not remember the elevation at Camp 17 or even the nicknames of the buildings at Camp 10 (e.g., the Nunatak Chalet). 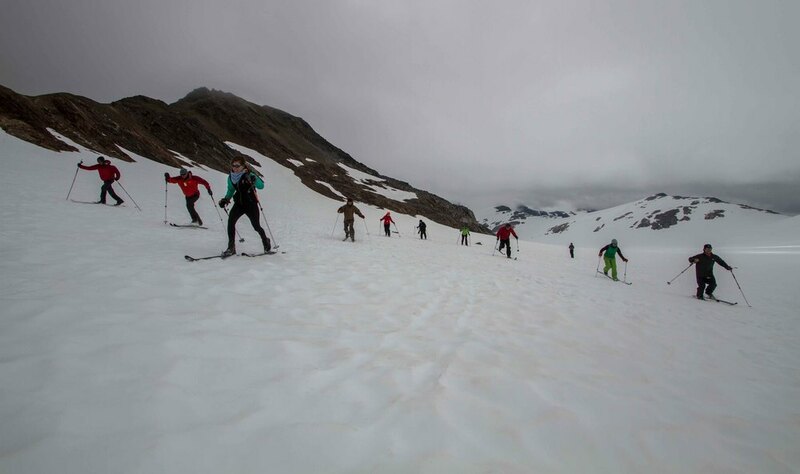 But I guarantee that they will remember throwing snowballs at “Spam-Man”, the eating contests, and skiing the slalom course – all integral parts of the 2013 JIRP Glacier Games.